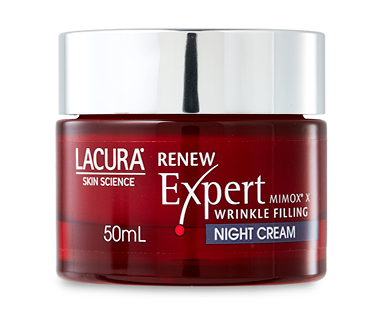 LACURA® Skin Science Renew Expert Night Cream SPF 15 is a highly effective, anti-aging regeneration night cream, that contains high performance active ingredient trio of Mimox® X, Antioxidative, white tea, cell to cell communicator based on crocus. The pampering night cream helps regenerate the skin during the night, leaving it feeling soft and smooth. For refreshed and revitalised skin in the morning and the appearance of youthful-looking, radiant and luminous complexion. Specially formulated for women 30+.